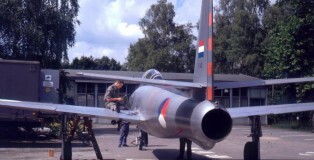 The Royal Netherlands Air Force Museum (MLM) was established at Soesterberg Air Base in 1968 and moved to a location nearby the village of Soesterberg , called Kamp van Zeist , in 1980 . In this gallery Hans and Frank show you a selection of photographs they made there in the course of time , representing its interesting collection of military aircraft. Dating back to the years 2011 to 2013 also a number of pictures are included , taken in the shelter area of Camp New Amsterdam and in the new housing of the museum at the former air base . In December 2014 a magnificent , new National Military Museum (NMM) has been opened to the public at the former Air Base . more than worth while visiting !